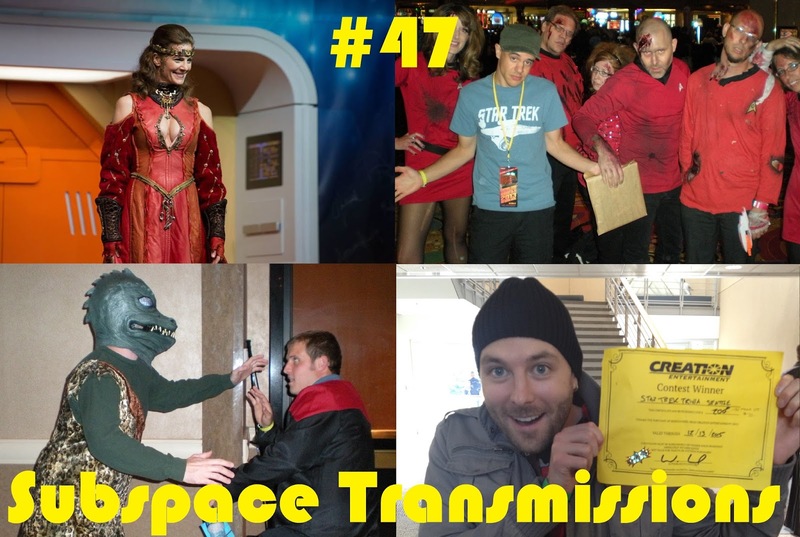 Subspace Transmissions: A Star Trek Podcast: EPISODE 47 - "HOW TO SURVIVE A STAR TREK CON!" Psyched up for the rapidly approaching Vegas Creation celebration, or another Trek fan event, this season? That's what we wanna hear! But are you totally prepared? This week hosts Cam Smith and Tyler Orton, accompanied by veteran con-going guest Tom Ball, hammer out all the logistics you need to keep in mind before dashing through those metaphorical gates into sci-fi nirvana. From merch room skills to party tips, photo-op advice to proper Q&A panel conduct, we hit all the bases in an effort to help make your con the ultimate experience possible. As an added bonus, we also name our "Must-see" Trek celebrities and answer some great fan mail! It's another embarrassment of riches, people. Hope you enjoy! *Terry Farrell photo courtesy of Shelly Ross. Read Roger Sanderson's Star Trek into Darkness review. Wanna appear on the show? Shoot us a 30 to 60-second audio clip letting us know your best STAR TREK CON TIPS AND STORIES and you could take the spotlight in an upcoming program! You can also send any other questions, topic ideas or feedback to subspacetransmissionspod@gmail.com!